Nestled at the foot of Umbobo Mountains, you will find Bayala Game Lodge. Ideally the Lodge accommodates for the whole family, group getaways and a bush wedding venue. 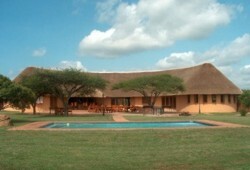 Bayala is a private game park, consisting of two separate 24 bedroom lodges. Each lodge consists of its own reception, lounge, and restaurant, bar, pool and conference venue. We are well known for attending to our guests’ needs, making their stay pleasant and one to remember. The Bayala Game lodge offers delightful accommodation that promotes a peaceful stay within nature, providing you with all the relaxation that you deserve. We also provide additional services like laundry, car wash and secure parking, as well as WI-FI services. The restaurant seats up to 50 people in a buffet style dining atmosphere. Weddings are hosted at the lodge, or under the beautiful green leave trees in the bushveld. The amazing bush environment with views that will leave you in awe, beautiful sunsets and abundant wildlife of all kinds is all part of the pleasant stay you will experience with us. We have various kinds of food menus available, with full bar facilities at the venue. We have partnered up with photographer Naas Stoop, Musical entertainment from Trudie and team, and Classic Hire covers the table and décor hiring. The conference venue caters for cinema style seating for 40 delegates, boardroom style for 40 delegates, classroom style for 40 delegates, u-shape style: 20 delegates and cocktail style for 96 delegates. Groups consisting of less than 20 delegates will be charged an additional hiring fee for the venue. The area is also renowned for its Zulu culture; tours to their traditional villages are available. You can also enjoy boat cruises, horse riding, elephant interaction and much more. Also we offer outdoor activities like Eco guided walks, Sundowner Game drives, scenic walks and amazing birdlife.